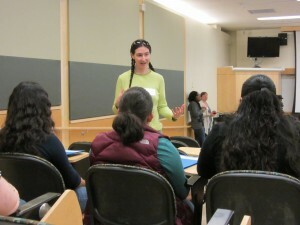 Hilary Palevsky, graduate student in chemical oceanography, talks to middle school students at the C2S2 climate change summit hosted by Andrill at UW in 2012. Graduate students, research scientists and faculty from across UW volunteer in classrooms, as speakers at public events, and much more. Introduction to Climate Change and Ocean Acidification. High School. Ballard. Presentation and Q&A to follow showing of DiCaprio’s 2016 movie “Before the Flood” . Church group. Leavenworth, WA. Climate Change and Impacts on Pacific Northwest. Often requested by civic groups, churches, and retirement communities. To request a presentation, email uwpcc@uw.edu or call the PCC office (206-543-6521). Want to keep informed of our public presentations? Follow us on twitter @PCCeduc. UW Earth and Space Sciences Outreach Science-based hands-on learning opportunities for K-12 students.